The film features in Paris, over the course of three years, from 1941 to 1944, during the Nazi occupation of France. A group of resistance fighters - most of them being teenagers, commit random and disorganized attacks against the occupying Nazi army, until an Armenian poet and factory worker; Missak Manouchian (Simon Abkarian), becomes the leader of this group of freedom fighters and together, with formulated, strategic attacks, the Manouchian Network is born and they become an army of crime - an army of criminal terrorists. The Army of Crime is a brilliant character study that features some very tremendous performances, especially from its younger cast, showing that they have no fear, being quite reckless in their attacks on the Nazi force occupying their country, even with innocent civilians being killed in the crossfire. The cast show that they are ready to die for their country and for the freedom that they are trying to win. The film charts the birth of their group (named FTP-MOI standing for Francs-Tireurs et Partisans – Main-d'Œuvre Immigrée) up until the bitter end for its members. The journey itself is quite intriguing, only sometimes plodding along and not as gripping to watch, but it is a journey definitely worth taking. The look of the film itself is quite striking to see, from the wartime setting in Paris, to the production and costume design, all adding to an incredibly accurate and authentic feeling to the era it is portraying. The film itself looks very nice, not the best quality, but director - Robert Guédiguian and cinematographer - Pierre Milon have captured the country in a particularly stunning fashion, which again, adds to the incredibly real and accurate feel to the country of France during that historic time. Like the majority of DVDs from Madman, this release just come with the standard theatrical trailer and trailers for other Madman releases as extras. 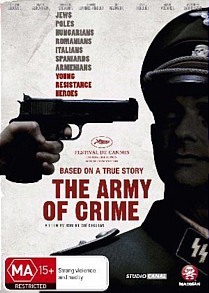 The Army of Crime is a respectively accurate film, showing the courageous and dangerous lengths that people will go to win back their freedom and punish those who have taken it from them.